Olives are native to the Mediterranean and are a vital component of the culture and diet of the various civilizations that have inhabited that region. The olive has long been a symbol of peace, glory, purity and wisdom. It is estimated that olives have been cultivated in the Mediterranean for about 7000 years and commercially grown on the island of Crete for about 3000 years. Olives were brought to California in the late 1700s to be grown at the missions established by the Spanish. 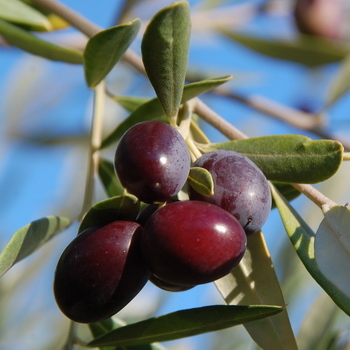 Olives like a long, hot growing season in order to ripen the fruit, but will perform adequately in coastal areas. They also need some winter chill for fruit set, but late spring frosts can damage flowers. Temperatures below about 15 degrees will damage the trees themselves and fruit is damaged at about 28 degrees. 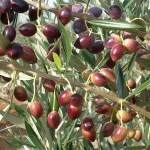 Olives need full sun, good drainage and only occasional watering once established. Because of their cultural requirements, we can only ship olives to the milder parts of California and Arizona. They are not suitable for any area that is very wet or extremely cold in the winter. The trees are evergreen and will be shipped in pots. A small tree of medium vigor that bears earlier than many other varieties. Suitable for high density planting. Fruit is small and produces a very aromatic, fruity oil that is low in bitterness. Fairly cold tolerant, disease resistant and pest tolerant. Cold hardy to zone 8. Self-fruitful, but will produce more if planted with Arbosana or Koroneiki. OLIVES CAN BE SHIPPED TO CALIFORNIA AND ARIZONA ONLY! Small tree that produces large crops of small olives that make premium oil. Fruit has a complex blend of fruitiness, pungency and bitterness. Late bearing and fairly cold hardy to zone 8b or 9. Self-fruitful, but produces higher yields when planted with Arbequina or Koroneiki. OLIVES CAN BE SHIPPED TO CALIFORNIA AND ARIZONA ONLY! One of the world's premier oil varieties. Delightful balance of fruitiness, bitterness and pungency. Also makes a good table olive after curing. Highly frost sensitive. Self-fruitful, but yields are increased when planted with Leccino or Pendolino. OLIVES CAN BE SHIPPED TO CALIFORNIA AND ARIZONA ONLY! Greek variety, originally cultivated on the island of Crete where the climate is relatively warm. Great for high density planting. Early producer with very small fruit. Excellent oil quality with very high polyphenols. Yield is high with a slight tendency for alternate bearing. Cold hardy to zone 10. Pollenized by Arbequina and Arbosana. OLIVES CAN BE SHIPPED TO CALIFORNIA AND ARIZONA ONLY! Used mainly as a pollenizer in Tuscany, the small fruit produces a mild oil with low bitterness and delicate pungency. Blooms early and profusely with a long bloom. Self sterile, so a pollenizer such as Frantoio or Leccino is required. For landscaping, Pendolino offers good cold hardiness and a dense, weeping canopy. Hardy to zone 8. OLIVES CAN BE SHIPPED TO CALIFORNIA AND ARIZONA ONLY!